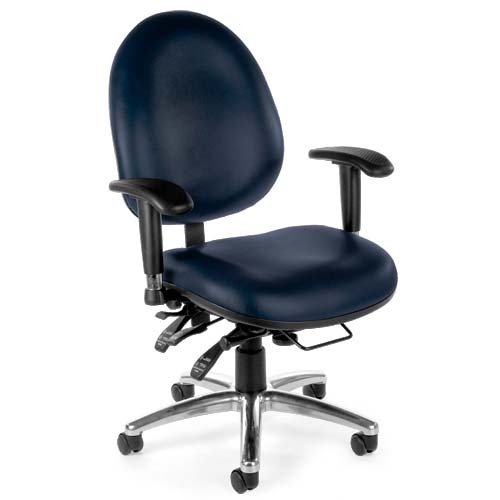 More on the OFM Hi-Back 24 Hour Big and Tall Anti-Microbial Vinyl Computer Chair (Navy) 247-VAM-605 below. OFM's 247-VAM Task Chair features anti-microbial/anti-bacterial vinyl. It is desgined for multi-shift, 24-hour use. One-touch sliding seat depth adjustment. Synchronized seat and back movement. Dual-track casters, allowing easy mobility on hard or carpeted flooring. 27" steel 5-star base with polished aluminum finish. 4 available colors, designed to match any office decor. Quick and easy assembly, with all necessary hardware included. *Also available in a teflon-coated, stain-resistant fabric. See "Related Products," below, for more information. This product meets or exceeds ANSI/BIFMA safety standards.